Apple CEO Tim Cook called the European Commission's recent ruling that left his company saddled with a 13 billion ($14.5 billion) tax bill "total political crap" in an interview published Thursday, suggesting Apple was targeted in the European Union probe. According to Cook, the ruling was potentially motivated by anti-U.S. sentiment on the part of the EU, reports the Irish Independent. 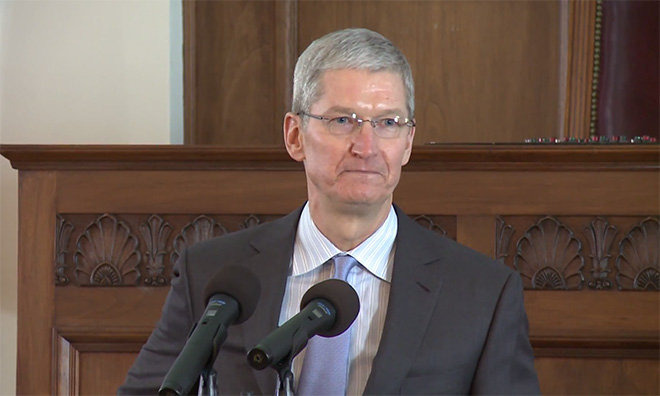 "I think that Apple was targeted here," Cook said. "And I think that (anti-US sentiment) is one reason why we could have been targeted. People in leadership positions in several countries tell me that this is the agenda. I don't know where that comes from. But what I feel strongly about is that this decision was politically based, of that I'm very confident. There is no reason for it in fact or in law." Cook also agreed with comments made by U.S. Secretary of Treasury Jack Lew, who said the tax ruling is a blatant grab at taxes owed to the U.S. government. "I think that's exactly what it is," Cook said. "I think it's a desire to reallocate taxes that should be paid in the U.S. to the EU." On Tuesday, Apple was ordered to pay $14.5 billion in back taxes plus interest for accepting illegally low tax rates in Ireland over the past ten years. The penalty, the largest ever handed down by the EU's executive body, was the result of an investigation into Apple's "Double Irish" tax loophole that allowed the company to route European profits through two Irish subsidiaries. The benefit, according to the commission, was effective tax rates of 0.005 percent in 2014 and 1 percent in 2003. As the figures are not in alignment with Ireland's standard tax rate of 12.5 percent, the country is being accused of providing Apple illegal state aid. "They just picked a number from I don't know where," Cook said. "In the year that the Commission says we paid that tax figure, we actually paid $400m. We believe that makes us the highest taxpayer in Ireland that year." Apple and Ireland disagree with the commission's decision and have lodged a formal appeal. Cook believes the commission is taking advantage of the situation in an effort to harmonize tax rates across the EU. By overstepping its granted authority, the EU is jeopardizing amicable trade relationships between member states and the U.S., he said. The comments closely align with an open letter Cook penned to European customers. In it, the Apple chief says his company pays its fair share of taxes in all jurisdictions, and stresses it did not ask for or receive special privileges in Ireland. Despite the kerfuffle, Cook affirmed Apple's commitment to Ireland, saying it has no intention of scrapping planned investments in the region. Last week, Apple got the green light to add 1,000 jobs at its headquarters in Cork, a project that calls for the construction of a new office block and supporting amenities. Prior to that, the company recently received approval to build the first phase of a data center in the town of Athenry in County Galway. "We've been spending a lot of money on building out a large location in Cork," Cook said. "We have a 37-year-old marriage with Ireland and it means something to us. It's a very deep relationship. Every time I go there it brings me such joy. It is an integral part of the company." Both the Cork expansion and upcoming data center buildout, the latter of which could take 10 to 15 years to complete, are expected to move forward. "I feel like Ireland stuck with Apple when it wasn't easy to stick with Apple and now we're sticking with Ireland," he said.